Selected research publications and reports from studies and investigations performed in RNAs in Southern Region (R8)/Southern Research Station (SRS). Bee Branch Devall, M. S. and P. F. Ramp. 1992. U. S. Forest Service Research Natural Areas and protection of old growth in the South. Natural areas journal 12(2). Much of the old-growth forest in the southern United States is on the national forests. The U.S. Forest Service Research Natural Areas (RNA) Program is one method for protecting old growth at the same time as making it available for scientific studies and educational purposes. This paper discusses the RNA program and describes several old-growth forests in the RNA system: the Red Gum, Overcup Oak, and Green Ash Research Natural Areas, three remnants of virgin forests in the Mississippi River floodplain; the Bee Branch RNA, a disjunct eastern hemlock and beech community in northern Alabama; and the Roaring Branch RNA, an old–growth hardwood and shortleaf pine forest in western Arkansas. Lake Winona Fountain, M. (1991). Tree and non-tree dimensions of an old-growth shortleaf pine stand: Lake Winona Research Natural Area. Restoration of old growth forests in the interior highlands of Arkansas and Oklahoma. Proceedings of the conference. Ouachita National Forest and Winrock International Institute for Agricultural Development. .
Lake Winona Fountain, M. S. and J. M. Sweeney (1987). “ECOLOGICAL ASSESSMENT OF THE LAKE WINONA RESEARCH NATURAL AREA.” Usda forest service southern forest experiment station research paper(235): 1–14. The Lake Winona Research Natural Area (LWRNA) covers 113.3 ha in the Ouachita mountains of Arkansas and was established in 1977. Analysis of the overstorey identified 22 species of tree, of which shortleaf pine (Pinus echinata) was much the most important, followed by white oak (Quercus alba) and blackgum (Nyssa sylvatica). Data are tabulated on the frequencies of the 22 species, together with information on the 50 shrub, woody vine and tree species of the shrub component and the 75 species of the herbaceous component. The ecological status and wildlife habitat value of the LWRNA are described. Roaring Branch Fountain, M. S. and J. M. Sweeney (1985). “ECOLOGICAL ASSESSMENT OF THE ROARING BRANCH RESEARCH NATURAL AREA.” Usda forest service southern forest experiment station research paper(213): 1–15. R.R. Reynolds Bragg, D. and M. G. Shelton (2009). Overstory Dynamics in an Uncut Pine-Hardwood Stand: Lessons From Seventy Years of Passive Management. Ecological Lessons From Long–Term Studies in Experimental Forests. A. P. Youngblood, Brian. Long–term demonstration projects on experimental forests can be adapted from their original goals to provide insights into contemporary research questions. For instance, a 32.4–hectare cutover parcel on the Crossett Experimental Forest, the eventual Reynolds Research Natural Area (RRNA), was reserved in 1936 to act as a control for more intensively managed study areas. Over the last 70+ years, the RRNA has been allow to develop under ‘natural’ conditions that include no harvesting or other human interventions–with the notable exception of fire control. From 1937 until the most recent measurement in 2007, overall stand basal increased from about 20 to 36 m2/ha. The shade-intolerant loblolly and shortleaf pines in this stand remained relatively constant at two-thirds of total basal area until the mid-1990s, after which they declined noticeably, dropping to just over 50% by 2007. The gradual development of a continuous hardwood, shrub, and liana under- and midstory, coupled with a thick litter layer, has severely suppressed pine regeneration. This long–term project has demonstrated that without intense large–scale disturbance events, perpetuating a significant pine component in mesic old–growth sites of the Upper West Gulf Coastal Plain is highly unlikely. Rather, a strategy that incorporates controlled burns and/or deliberate interventions such as underplanting pine seedlings or the release of well–established pine saplings may provide better opportunities for improving pine representation. This is not the only lesson that the long-term study of the RRNA has provided. The gradual transition from pine to hardwood may not dramatically influence carbon storage in mature, closed canopy stands–our data show an aboveground biomass increase of ~10% during the last two decades, even as pine stocking has declined and overall basal area remains largely unchanged. From a sequestration perspective, the conversion to hardwoods, with their denser wood and larger crowns, has more than offset the loss of pine. R.R. Reynolds Bragg, D. C. (2004). “Composition and structure of a 1930s–era pine–hardwood stand in Arkansas.” Southeastern Naturalist 3(2): 327–344. This paper describes an unmanaged 1930s–era pine–hardwood stand on a minor stream terrace in Ashley County, AR. Probably inventoried as a part of an early growth and yield study, the sample plot was approximately 3.2 ha in size and contained at least 21 tree species. Loblolly pine comprised 39.1% of all stems, followed by willow oak (12.7%), winged elm (9.6%), sweetgum (7.8%), water oak (6.7%), white oak (6.2%), red oak (4.9%), and hickory (4.6%). Pine, sweetgum, and oak dominated the midcanopy and overstory, with few late successional species. Stand basal area averaged 32 m2/ha, with 409 live trees/ha. The dominance of shade intolerant species, the lack of very big trees, and a scarcity of snags suggested that this stand was second–growth and likely arose from a disturbance in the mid–19th Century. Because this forest was sampled in the 1930s, its composition and structure should better reflect mature presettlement pine–hardwoods on minor stream terrace sites than modern examples. R.R. Reynolds Bragg, D. C. (2004). “Composition, Structure, and Dynamics of a Pine-Hardwood Old-Growth Remnant in Southern Arkansas.” Journal of the Torrey Botanical Society 131(4): 320–336 The Levi Wilcoxon Demonstration Forest (LWDF) was originally established by the Crossett Lumber Company in 1939 to promote forestry research and demonstration in the Upper West Gulf Coastal Plain of southern Arkansas. The reserve currently has at least 27 different overstory tree species, with loblolly pine (Pinus taeda L.), shortleaf pine (Pinus echinata Mill. ), and white oak (Quercus alba L.) comprising the majority of stand basal area. Hardwoods are most numerous, dominated by shade-tolerant species such as red maple (Acer rubrum L.), flowering dogwood (Cornus florida L.), blackgum (Nyssa sylvatica L.), and winged elm (Ulmus alata Michx. ), especially in the subcanopy and understory. Large pines, oaks, and sweetgum are scattered throughout the stand, with some individuals exceeding 100 cm DBH and 45 m tall. Overstory trees rarely proved sound enough to age, but some stumps, logs, and increment cores suggest that the dominant canopy pines are 100 to 150 years old, with the largest individuals exceeding 200 years. Pines contributed the greatest amount of coarse woody debris. The average volume of dead wood was noticeably less than other examples of old–growth upland forest in the eastern United States, attributable largely to salvage. Increased windthrow and the salvage of dead and dying pines have become the primary perturbations of the LWDF. Without large-scale disturbance like catastrophic fire or logging, shade–intolerant pines, oaks, and sweetgum (Liquidambar styraciflua L.) will decline in prominence, to be replaced by more shade-tolerant species. R.R. Reynolds Bragg, D. C. (2014). “Eighty Years of Silvicultural History at the Crossett Experimental Forest.” Journal of Forestry 112(2): 237. R.R. Reynolds Bragg, D. C. and J. M. Guldin (2015). “The Silvicultural Implications of Age Patterns in Two Southern Pine Stands after 72 Years of Uneven–Aged Management.” Forest Science 61(1): 176–182. A randomized sample of 250 loblolly (Pinus taeda L.) and shortleaf (Pinus echinata Mill.) pine ring counts was collected from the Good and Poor Farm Forestry compartments on the Crossett Experimental Forest. These mature, pine–dominated stands have been managed using uneven–aged silviculture since 1937. Our sample shows that both of these compartments have many different age classes although few distinct cohorts. Over the decades, pine recruitment followed the dozens of timber harvests and occasional natural mortality events (e.g., lightning strikes, ice storms, windthrow, insects, and disease). After more than 70 years of active management, only 5% of the overstory pines are shortleaf and about 6% of all pines originated before the imposition of uneven–aged silviculture. The age structure of these stands can be used to adapt conventional silvicultural treatments. For example, a wide range of ages was found in the sawtimber size classes, indicating that productivity improvements are still possible. The data also suggest that it may be possible to modify current practices to alter the age structure to favor other kinds of ecosystem services (e.g., wildlife habitat). R.R. Reynolds Zhang, M. (2000). Quantification of snags and downed wood in the RR Reynolds Research Natural Area and Good Forty Demonstration Area in southeastern Arkansas. Turkey Ridge Ison, C. F. (1996). “Vascular Flora of St. Francis National Forest in Arkansas.” Castanea 61(1): 49–61. St. Francis National Forest is at the southernmost end of Crowley’s Ridge in Lee and Phillips Counties of Arkansas. Most of the Forest is located on Crowley's Ridge and has narrow ridges and valleys carved into the loessal soils. A small portion of the Forest is located along the Mississippi and St. Francis Rivers and is characterized by level, alluvial soils. This study identified 104 vascular plant families, 285 genera, 424 species and 11 subtaxa on the Forest. The study was begun in the fall of 1989 and completed in the spring of 1991. Rock Creek Abbott, J. R., et al. (2001). “VASCULAR PLANTS NEW TO KENTUCKY.” SIDA, Contributions to Botany 19(4): 1199–1202. Fourteen species of vascular plants are reported new to the state of Kentucky, U.S.A. Five of these are European weeds: Anthoxanthum aristatum, Aphanes microcarpa, Erysimum hieraciifolium, Lathyrus tuberosus, and Vicia tetrasperma. The other nine are native species known from adjacent states and were, thus, not entirely unexpected: Acalypha deamii, Carex austrocaroliniana, Centunculus minimus, Elymus wiegandii, Equisetum � ferrissii, Leucothoe fontanesiana, Lupinus perennis, Polygonum cilinode, and Silene nivea. Se presentan 14 especies de plantas vasculares que fueron descubiertas como nuevas para el estado de Kentucky, EE.UU. Cinco de �stas son malezas de Europa: Anthoxanthum aristatum, Aphanes microcarpa, Erysimum hieraciifolium, Lathyrus tuberosus, y Vicia tetrasperma. Las otras nueve son especies nativas ya conocidas de los estados de alrededor y, por eso, no fueron totalmente inesperadas: Acalypha deamii, Carex austrocaroliniana, Centunculus minimus, Elymus wiegandii, Equisetum � ferrissii, Leucothoe fontanesiana, Lupinus perennis, Polygonum cilinode, y Silene nivea. Rock Creek Pederson, N. (2010). “External Characteristics of Old Trees in the Eastern Deciduous Forest.” Natural Areas Journal 30(4): 396–407. Because old trees contain centuries of environmental history, investigators are increasingly turning to dendrochronology to create context for current environmental change. While a suite of characteristics to identify old trees has been developed, most of these characteristics are for conifers or trees growing in low–density forests. Given that the diverse Eastern Deciduous Forest (EDF) is dominated by a species–rich, angiosperm–dominated woody flora, old–growth forests are scarce in the EDF, and research permits in natural areas often limit the number of trees that can be sampled, having a suite of characteristics that identify old trees for a wider range of species increases the likelihood of efficiently creating longer depths of ecological history. The common indicators of old (> 250 year old) EDF angiosperms are presented to aid in the recovery and preservation of these living sources of information. Six common external characteristics of old angiosperm trees include: (1) smooth or “balding” bark; (2) low stem taper; (3) high stem sinuosity; (4) crowns comprised of few, large–diameter, twisting limbs; (5) low crown volume; and (6) a low ratio of leaf area to trunk volume. The existence of old trees in the landscape can also be related to life–history traits or land–use histories. Both professionals and lay folk can be trained to identify these traits and environmental conditions. While these characteristics and settings generally signal the potential for old trees, there is no guarantee that they represent old ages. However, these characteristics should aid in the discovery of old trees throughout the EDF. Rock Creek Pederson, N., et al. (2012). “Long–term drought sensitivity of trees in second–growth forests in a humid region.” Canadian Journal of Forest Research 42(10): 1837–1850. Classical field methods of reconstructing drought using tree rings in humid, temperate regions typically target old trees from drought–prone sites. This approach limits investigators to a handful of species and excludes large amounts of data that might be useful, especially for coverage gaps in large–scale networks. By sampling in more “typical” forests, network density and species diversity would increase in ways that could potentially improve reconstructions. Ten nonclassical tree–ring chronologies derived from randomly selected trees, trees from logged forests, or both were compared to more classical chronologies and an independent regional drought reconstruction to determine their usefulness for dendrohydroclimatic research. We find that nonclassical chronologies are significantly correlated to classical chronologies and reconstructed drought over the last 2–3 centuries. While nonclassical chronologies have spectral properties similar to those from classical dendroclimatic collections, they do lack spectral power at lower frequencies that are present in the drought reconstruction. Importantly, our results show that tree growth is strongly dependent on moisture availability, even for small, randomly selected trees in cut forests. These results indicate that there could be more data available in areas with few current tree–ring collections for studying climate history and that drought plays an important role in humid forests. Bayou Boeuf Tucker, S. S. (1980). AN ECOLOGICAL ASSESSMENT OF BAYOU BOEUF RESEARCH NATURAL AREA, RAPIDES PARISH, LOUISIANA. Louisiana State University, Baton Rouge, LA. Master of Science. Cunningham Brake Allen, C. (1993). Ecological assessment of the Cunningham Brake Research Natural Area in the Kisatchie National Forest, Louisiana. Unpublished report. Northeast Louisiana University, Department of Biology. Cunningham Brake Mathies, P. S., et al. (1983). “The Vascular Flora of Cunningham Brake, a Cypress–Gum Swamp in Natchitoches Parish, Louisiana.– Castanea 48(1): 24–31. 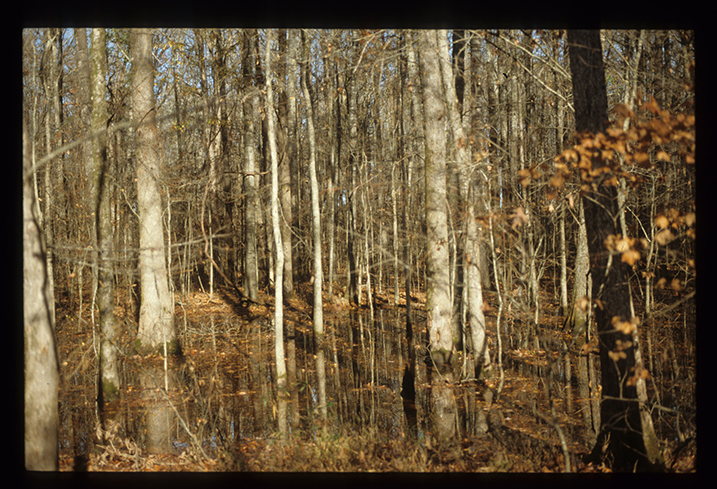 A floristic survey of Cunningham Brake, a cypress–gum swamp located in Kisatchie National Forest approximately 32 kilometers south of Natchitoches, Louisiana, was conducted from February, 1977, to June, 1978. The study area is characterized by six distinct habitats: 1) cypress–gum swamp; 2) lowland hardwoods; 3) open sand bars and edges of Kisatchie Bayou; 4) seepage areas; 5) wet, open areas; and 6) disturbed areas. The annotated list of taxa includes 81 families, 213 genera, and 313 species. Green Ash Ramp, P.F. 1990. Ecological assessment of the Red Gum, Overcup Oak and Green Ash Research Natural Areas in the Delta National Forest, Mississippi. Unpublished manuscript for the USDA Forest Service, Southern Forest Experiment Station, New Orleans, LA. Harrison Devall, M. S., et al. 1991. Dendroecological analysis of a longleaf pine Pinus palustris forest in Mississippi. Vegetation 93(1): 1–8. A climate model with time varying parameters was fit to longleaf pine (Pinus palustris) tree rings collected from the proposed Harrison Research Natural Area of the De Soto National Forest in southern Mississippi. The purpose of the analysis was to determine if any unexpected disturbances had influenced the growth of the trees. Current September temperature, August rainfall and February Palmer Drought Severity Index (PDSI) were found jointly to be the best variables in the model to predict growth. August rain had a constant significant effect on growth and February PDSI was not significant except between the years 1968–1983. It was concluded that the Harrison area has been in equilibrium for the past 50 years since no apparent outside influences have caused the trees to become less sensitive to climate. Thus, the forest is a good candidate for a Research Natural Area. Nuxubee Crest Moore, A. D. 1993. A floristic survey of the Noxubee Crest Natural Area of the Tombigbee National Forest, Thesis (M.S.) – Mississippi State University: v, 64 leaves. Vascular plants and bryophytes were surveyed in the Noxubee Crest Natural Area of the Choctaw Wildlife Management Area, Winston County, Mississippi. The study area, in the Tombigbee National Forest, is of floristic interest because of the time the Natural Area has remained undisturbed by man. Fifty–seven collecting trips were made between October, 1991, and June, 1993. A total of 1425 specimens was collected which represents 452 species in 93 families of vascular plants and 30 species in 19 families of bryophytes. The floristic list includes the type of habitats in which each species occurs as well the common names, if any. Three major habitats are discussed and characteristic species of each type are listed. Summaries of the soils, geology, climate, and topography are also presented. Overcut Oak Devall, M. S. and P. F. Ramp 1992. U. S. Forest Service Research Natural Areas and protection of old growth in the South. Natural Areas Journal. 12(2): 75–85. Much of the old–growth forest in the southern United States is on the national forests. The U.S. Forest Service Research Natural Areas (RNA) Program is one method for protecting old growth at the same time as making it available for scientific studies and educational purposes. This paper discusses the RNA program and describes several old–growth forests in the RNA system: the Red Gum, Overcup Oak, and Green Ash Research Natural Areas, three remnants of virgin forests in the Mississippi River floodplain; the Bee Branch RNA, a disjunct eastern hemlock and beech community in northern Alabama; and the Roaring Branch RNA, an old–growth hardwood and shortleaf pine forest in western Arkansas. Overcut Oak Ramp, P.F. 1990. Ecological assessment of the Red Gum, Overcup Oak and Green Ash Research Natural Areas in the Delta National Forest, Mississippi. Unpublished manuscript for the USDA Forest Service, Southern Forest Experiment Station, New Orleans, LA. Red Gum Devall, M. S. and P. F. Ramp 1992. U. S. Forest Service Research Natural Areas and protection of old growth in the South. Natural Areas Journal. 12(2): 75–85. Much of the old–growth forest in the southern United States is on the national forests. The U.S. Forest Service Research Natural Areas (RNA) Program is one method for protecting old growth at the same time as making it available for scientific studies and educational purposes. This paper discusses the RNA program and describes several old–growth forests in the RNA system: the Red Gum, Overcup Oak, and Green Ash Research Natural Areas, three remnants of virgin forests in the Mississippi River floodplain; the Bee Branch RNA, a disjunct eastern hemlock and beech community in northern Alabama; and the Roaring Branch RNA, an old–growth hardwood and shortleaf pine forest in western Arkansas. Red Gum Ramp, P.F. 1990. Ecological assessment of the Red Gum, Overcup Oak and Green Ash Research Natural Areas in the Delta National Forest, Mississippi. Unpublished manuscript for the USDA Forest Service, Southern Forest Experiment Station, New Orleans, LA. Black Mountain McLeod, D. (1981). Baseline data for hardwood forests in the Black Mountain Research Natural Area including vegetation patterns. Final report to USDA Forest Service, Southeast Experiment Station. Forest Service Project No, FS–SE–1102. Walker Cove Dickison, G. J. (1980). Composition and stand dynamics of an old–growth upper cove hardwood forest in Walker Cove Research Natural Area, Pisgah National Forest, North Carolina. Walker Cove Held, M. E. (1983). “Pattern of Beech Regeneration in the East–Central United States.&rduo; Bulletin of the Torrey Botanical Club 110(1): 55-62. Fagus grandifolia Ehrh. (American Beech) reproduces from seed and/or root sprouts. Although seeding must be the mechanism for initial establishment, root sprouting is considered by many researchers to be the main mode of reproduction in this species in certain areas of its range. Eight forested areas within the east–central portion of the range of Fagus grandifolia were selected for study of the environmental conditions related to the occurrence of root sprouts and/or seed–origin individuals. Multivariate statistical techniques such as principal component analysis, canonical correlation analysis and, stepwise regression analysis were used in this study to examine the relationship between environmental parameters and the reproductive activity in this species. Over the range of Fagus grandifolia, root sprouting is a mechanism by which this species survives in a forest within an area where environmental parameters are harsh. This study indicates a partial shift from seedling establishment toward a dependence on vegetative reproduction in areas where climate is more severe. Within each forest, however, the exposure of the slope on which a parent beech tree is located is an indicator of the possible origin of the beech juvenile individuals around that mature tree. These results do not preclude the occurrence of either root sprouts or of seed–origin individuals within any site in any area of the range of this species. Walker Cove Runkle, J. R. (1981). “Gap Regeneration in Some Old–growth Forests of the Eastern United States.” Ecology 62(4): 1041–1051. Tree replacement in gaps was studied in old–growth mesic forest stands in western Pennsylvania, Ohio, and the southern Appalachian Mountains. Predictions of future overstory composition, based on sapling composition in small gaps (average 200 m2), were compared to current canopy composition. Both Markov analyses and simple average sapling composition of gaps support the hypotheses that regeneration in small gaps was sufficient to perpetuate the current canopy species composition of the stands studied. In some cases the saplings most likely to replace a dead canopy tree were of the same species. In other cases, especially low–diversity beech–sugar maple stands, each species seemed to enhance significantly the success of the other species. Walker Cove Runkle, J. R. (2000). “Canopy Tree Turnover in Old-Growth Mesic Forests of Eastern North America.” Ecology 81(2): 554–567. I studied the dynamic nature of old–growth, eastern U.S. forests by addressing the following questions: (1) How much do stand density, basal area, and size structure vary over time within several old–growth remnants? (2) How do mortality and growth rates vary with stem size? (3) How much does the importance of individual species vary over time and space? (4) At what rate do snags and stumps form and deteriorate? In 1990–1991, I resampled canopy stems within several old-growth remnants in the southern Appalachians, in Hueston Woods State Park, Ohio, and in the Tionesta Scenic and Research Natural Areas, Pennsylvania. I had previously sampled those sites in 1976–1977 using the point–centered quarter method. I remeasured the same trees and measured new trees if the old ones had died or if a new stem closer to the point than the old stem for that quarter had grown to > 25 cm in diameter at breast height. Density and basal area changes were small. Density changes equaled –0.33%, –0.52%, and 0.00%/yr for the southern Appalachians, Hueston Woods, and Tionesta sites, respectively. Corresponding basal–area changes were 0.03%, –0.22%, and 0.45%/yr. Mortality increased consistently with stem size in all three areas. However, growth rates of smaller stems more than compensated for the higher mortality rates of larger stems, so that overall stem size increased between samples. Most species changed little in relative density or basal area. Overall Fagus showed the largest changes between samples, with a small decrease in the southern Appalachians, a larger decrease in Hueston Woods, and an increase in Tionesta. Trees usually died standing, breaking off at a variety of heights. For example, only 6–27% of trees that died were uprooted, depending on region, whereas 16–31% broke at a height of > 16 m. Total snag densities were 15–18 snags/ha. In general these stands were marked by slow changes toward fewer, larger stems, even after centuries in which no major disturbances had occurred. However, changes in pathogens, climate, and atmospheric chemistry could change these trends in the future. Walker Cove Runkle, J. R. and T. C. Yetter (1987). “Treefalls Revisited: Gap Dynamics in the Southern Appalachians.” Ecology 68(2): 417–424. In 1976-1977, 284 gaps (canopy–opening sizes 1–1490 m∧2) were sampled (age, size, species composition) from old–growth mesic forests in Great Smoky Mountains National Park, Joyce Kilmer Wilderness Area and Walker Cove Research Natural Area. In 1983, the woody vegetation (stems @>1 cm dbh) of 273 of these gaps was resampled, rates of gap closure by canopy tree branch growth and sapling height growth were estimated, and incidences of disturbances occurring since 1976–1977 were noted. The average yearly crown extension growth rate was 18 cm/yr, with much variation among species and individuals. Some individual crowns grew into the canopy opening as much as 4 m in the 7 yr. Saplings grew an average of 30 cm/yr in height, again with much variation. Overall, taller saplings grew somewhat faster than smaller ones and saplings in large gaps grew faster than those in small gaps. These two rates of gap closure together suggest that most saplings will require two or more gap episodes to reach the forest canopy. For woody vegetation, basal area per unit gap area was originally highest in small gaps, though it increased between sampling dates most in large gaps. Stem density had been highest in small old gaps, but decreased the most in old gaps. Tsuga canadensis, Fagus grandifolia, Acer saccharum, and Halesia carolina were the most important species in the gaps studied. Most species did not change in relative density or dominance between the two sampling dates and showed no significant correlations between those parameters and gap size and age. Overall, Tsuga and Fagus decreased and Acer saccharum increased in importance. High rates of repeat disturbance favor species able to grow in intermediate light levels and to survive several periods of suppression before reaching the canopy. Tiak Hoagland, B. W. and N. A. McCarty (2009). “Composition and structure of bottomland forest vegetation at the Tiak Research Natural Area, McCurtain County, Oklahoma.” Oklahoma Native Plant Record 9(1). Cross Timbers Quinn, W. J. 1996. A study of the vegetation of the Western Cross Timbers Research Natural Area. USDA/Forest Service Technical Paper, pp. 1–30. Mill Creek Cove Quinn, W. J. 1998. A study of the vegetation of the Mill Creek Cove Research Natural Area. USDA/Forest Service Technical Paper, pp. 1–71. Ramsey’s Draft Breil, D. A. (1973). “Two Bryophytes New to Virginia.” The Bryologist 76(2): 315. Moerkia hibernica and Buxbaumia subcylindrica are reported as new to Virginia. Ramsey’s Draft Fansler, W. W. (1984). A floristic study of Ramsey’s Draft Wilderness Area, Augusta County, Virginia. Ramsey’s Draft Rawinski, T. J. F., G.P. ; Judge, F.V. (1994). Forest vegetation of the Ramsey’s Draft and Little Laurel Run Research Natural Areas, Virginia: Baseline ecological monitoring and classification. Richmond, VA, Virginia Department of Conservation and Heritage, Division of Natural Heritage. Ramsey’s Draft Stevens, G. C. (1986). “Dissection of the Species–Area Relationship Among Wood–Boring Insects and Their Host Plants.” The American Naturalist 128(1): 35–46. The species–area relationship between wood–boring insects and the geographic range of their host plants is derived from the tendency for wide–ranging plants to be a part of more wood–boring insect communities than plants with smaller geographic ranges. In contrast to the expectation of the area–per se hypothesis, plants in a given forest that have large geographic ranges do not show richer wood-boring insect faunas than co–occurring plants with small ranges. The passive–sampling hypothesis can also be excluded because sampling differences do not account for the pattern. Only the habitat–heterogeneity explanation for the species–area relationship is consistent with the data and analyses presented. Ramsey’s Draft Stewart, R. E. (1956). “Ecological Study of Ruffed Grouse Broods in Virginia.” The Auk 73(1): 33–41.